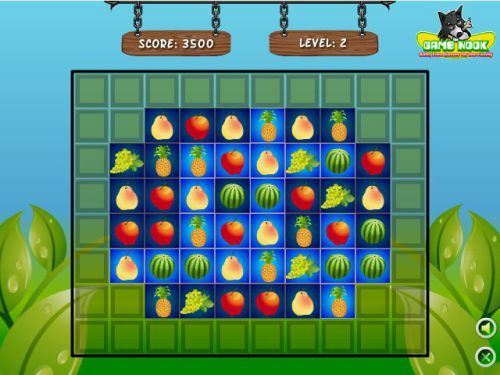 Description Fruit Harvesting is a match 3 game with 20 challenging levels. You need to light up all the tiles to win a level. Controls Line up 3 or more of the same type of fruit next to each other horizontally or vertically to make a match. Once a match is made the tiles beneath the matched fruit will change color from dark blue to light blue if they aren't already light blue and the matched fruits will disappear. A level is complete once there are no longer any dark blue tiles on the board.